Musings on Markets: Dream Big or Stay Focused? Lyft's Counter to Uber! Love reading your posts as always. 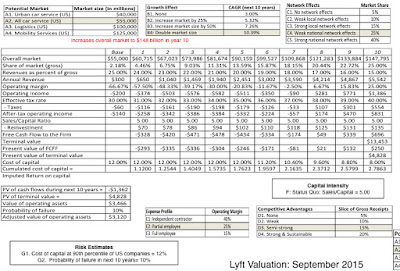 I was wondering perhaps whether it would make sense to include Yandex.Taxi in the valuation? It is hard to pinpoint the precise financials and billings (best way to do it is to look at the company's non core/other revenues). Having said that, according to an analyst report, in 2013 Yandex.Taxi generated 134.4mm rub in revenues, which amounted to 0.3% of total revenues at the company, or 52% of non-core revenues. I have also attached the latest Q2 2015 report, which puts other revenue at 3%. If we take a conservative estimate of 50% of other revenue (or 1.5% of total revenues coming from Yandex.Taxi we arrive at a figure of 208.8MM rub). The average FX rate over the same period was 52.65 USD/RUB, which yields quarterly revenue of USD 3.965MM. Overall this puts the company in a much smaller valuation range than the other companies listed, however, given the potential and the monopolic element of the market (this would be the same as Google launching its own ride hailing service to compete with Uber in the USA), I was wondering whether it might be worth having a deeper look at. The FX fluctuations make it a difficult play, and also the potential lagging in internet advertising as the Russian economy experiences a downturn, however my second point is maybe it may be worth looking at YNDX as an emerging markets internet play as well as a small exposure to car sharing in Russia, CIS and maybe even Turkey? I wanted to get your thoughts on whether it is correct to say that Uber is priced at $51 billion ? $51 billion number would have most probably been arrived at by the price per share from the latest round of financing applied to total outstanding shares that Uber has. But as in most VC companies, subsequent rounds get certain rights and preferences over the previous rounds. So is it fair to use the price from the latest round and apply to all shares ? Isn't a better indication of price arrived at by using option pricing method (back solve), which will price the shares issued in the previous rounds lower compared to the share price from the most recent round (assuming the most recent round ranks higher in terms of rights and preferences) and would eventually result in a price of Uber much lower than $51 billion. This article is an interesting exercise. Perhaps it is not relevant to the desired objectives, but it does seem the analysis above ignores several aspects to Uber and Lyft which are not financial metrics, but which manifest in very real ways. These include the corporate mentalities of both companies. Uber is infamously combative with respect to existing regulatory authorities and is reluctant to engage in any activities related to benefiting drivers (no tipping, last to implement insurance and earn guarantees, last to implement many other capabilities like navigation in app). This can also be seen in more specific examples like working with airports to allow legal operation of ride sharing services there.